The WA22 round thread screw locking, IP67 plastic connector range is designed to meet the high requirements of industrial applications under harsh environmental conditions. Using a combination of sealing washers, inserts; grommets and PG11 threaded compression nuts; the insulators and contact areas in these connectors are sealed against environmental elements. The seals are sited so that the integral backshell can be easily removed to allow accurate soldering or screwing of the cores of the incoming cable. 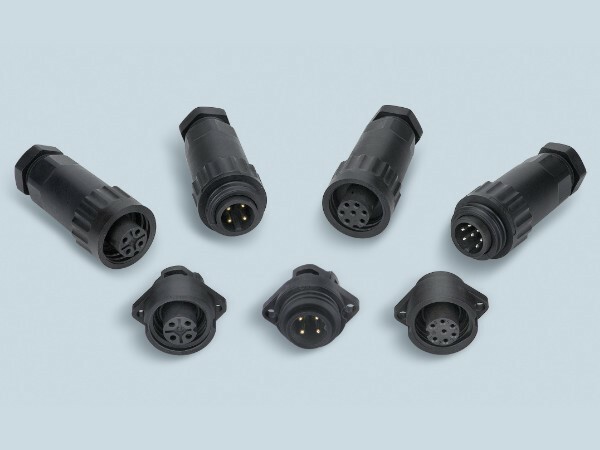 Connector end caps are available to suit the panel mount version and IP67 integrity is achieved when male and female connectors are mated or when the IP67 end cap is fitted to the IP67 socket body. They are not intended for use under continuous pressure. In consideration of the broad range of ‘rained on’ definitions, the industry appears to have agreed to a ‘test of immersion for 30 minutes, at a depth of 1 metre, or the equivalent air test at 1.45 psi. That is the Qualification Test. (Protected against the effects of temporary immersion between 15cm and 1metre. Duration of test 30minutes). Working temperature : – 40 to 100C. The mechanical properties of the WA22 connectors allow temperatures of -40 to 100 degrees C. They are RoHS compliant, CE marked, small, lightweight and extremely cost-effective ~ without compromising the integrity of the interconnection. The WA22 connectors are designed for at least 500 mating cycles and the cable entry can accommodate cable diameters from 7 to 10mm. The receptacle connectors share the same mounting footprint as similar connectors from Amphenol-Tuchel (C16-1) and Binder (962/963). These connectors will mate with or replace those and other similar industry standard connectors.